Several Luton Town players merrily posed for photographs with their supporters in the minutes following the final whistle. That was shortly after interrupting their warm down to exchange applause with the remnants of the 2,680 followers who had packed into the Milton end. Of course, by that stage Paul Robinson had long departed the Fratton Park pitch. 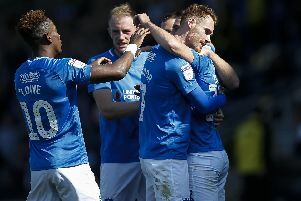 Pompey’s skipper was forced off in the 71st minute having collided with Cameron McGeehan as he prevented the midfielder scoring from close range. It appeared the teenager had been presented with the simple opportunity of heading into a empty net after Mark Cullen’s near-post flick-on had taken keeper Paul Jones out of the equation. Then, as ever, Robinson popped up with a crucial intervention to help preserve the 2-0 lead for Andy Awford’s side. Such bravery collected a fractured right cheekbone and an early exit as he groggily left the field. As for getting involved in selfies, the 33-year-old did post one on his Twitter account late on Saturday night, his battle scars ensuring a far from pretty sight. While there were those of a Luton persuasion whose mood appeared unaffected by a Fratton Park defeat, their nemesis today faces surgery. All in a day’s work for a gutsy central defender not afraid to put his body on the line and once again enjoying an outstanding match for the Blues. Robinson epitomised a magnificent rearguard display from Awford’s men which saw off a clearly talented Hatters side previously sitting fifth in League Two. In the second half especially, the hosts were put under intense scrutiny – wave upon wave of Hatters pressure applied while attacking the Milton end. At times it was desperate, on occasions frantic, certainly there were moments of edge-of-the-seat stuff for the Fratton faithful to endure. Bodies flung into the ball’s trajectory to prevent it passing, fearless tackles inside a crowded penalty area and endless endeavour from those in midfield to protect. Pompey remained unbreached and, such was their immense resilience in repelling an often-relentless opposition, Jones barely had a shot to deal with. John Still’s side were largely held at arm’s length throughout, as Awford’s team picked up a sixth clean sheet in 10 matches to continue their impressive resurgence. The heartbeat was Robinson, who with consummate ease effortlessly dealt with the supposed threat of Luton’s 12-goal leading scorer Cullen. The 22-year-old couldn’t shake off the Blues defender’s attention all afternoon as he was ruthlessly dominated both on the ground and in the air. Eventually when Cullen did give him the slip – courtesy of Robinson’s substitution – he lasted only four minutes longer before he was replaced by Paul Benson. Not that the Hatters achieved much joy in the influential defender’s absence, for the remaining 19 minutes Adam Webster slotted in comfortably to keep the back line intact. Then there was Andy Barcham, making his first appearance as a wing-back in Awford’s starting line-up following the tightening of Josh Passley’s hamstring. Post-match he admitted he had found it tough at times to rein in his natural attacking instincts and serve in a foreign role. Nonetheless, he did the club proud with his non-stop efforts and drew a standing ovation from the Fratton faithful when replaced by Danny East late on. Comforting also to see East’s first appearance of the season. He had spent time out through injury and then had a successful loan spell at Aldershot before his Thursday recall. Plenty of competition at present, then, for that right-sided position in Awford’s side, while fellow defenders Ben Chorley and Nicky Shorey couldn’t even get in the squad as their Fratton Park stays tick down to when their contracts expire in the summer. Barcham was the only change, albeit an enforced one, to the side which picked up a disappointing point at 10-man Accrington Stanley the previous Saturday. There was no place in the match-day 18 for Chorley, back from a one-match suspension following his sending off at Northampton. Neither was West Ham loanee Paul McCallum, who has now long since served his seven-game ban, included, as his Blues stay continues to disappoint. Yet the strikeforce of Matt Tubbs and Ryan Taylor is these days irresistible and once again the double act were at their deadliest in a fixture of few goal-scoring opportunities for either side. A goal in each half took the tally to 10 in their last 10 matches together, as they supply the cutting edge to a team which so often this season has struggled to net. It was Tubbs who made the breakthrough on three minutes, Wallace’s cross from the right met with a clever near-post volley which flashed across Elliot Justham. It was a moment of quality from the former AFC Wimbledon striker as he netted for the first time since last month’s memorable hat-trick at Cambridge. Perhaps Taylor’s goal-scoring form is more of a surprise to Pompey fans but he grabbed the second on 62 minutes, shortly after Wallace had struck the left-hand post. Inevitably Wallace was involved again, surging down the right before his cross took a touch off Tubbs and fell into the path of Taylor, who lashed a ferocious shot into the net. It was a fifth goal in six appearances for a striker whose workrate and effort can never be questioned, yet goal ratio has consistently been the subject of fan criticism. Nonetheless, the duo have struck up quite a rapport and their ruthlessness proved decisive against the Hatters on Saturday. There was still time for Robinson to come to the rescue, picking up his facial injury in the process, as he thwarted McGeehan on the line as the Blues kept the visitors at bay. Then, in stoppage-time, Dan Butler cleared a header from ex-Pompey Academy defender Luke Wilkinson off the left-hand post. So a 2-0 victory was completed for the hosts, who climb into 13th spot and now within eight points of the play-off places as they prepare for the visit of Cheltenham Town tomorrow. Not that Luton fans left empty-handed – there were plenty of photos for the scrapbook.